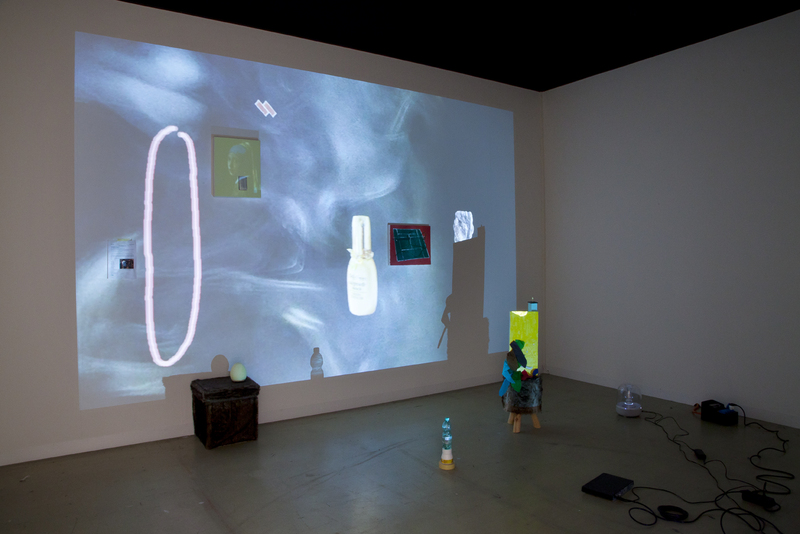 Trisha Baga is a collaborator with the world. Her artistic practice is multi-disciplinary, variously combining video, sculpture, painting, and performance. Her work addresses a variety of contemporary artistic concerns: cinema, mediums, and media — as well as narrative, fiction, comedy, and theater. Baga’s installations tend to be immersive, though they don’t make demands on our attention. With 3D glasses on, walking through rooms scattered with casual arrangements of store-bought items and handcrafted things — and lit by large-scale 3D video projections — viewers make their own choices about where and when to look. Both the objects in the space and the images on the wall are boldly arranged in terms of light, color, and composition. So we focus on those details. But as we move through the (often darkened) space, we cast shadows in the video projections, which match the shadows cast by the objects themselves. And our bodies come into dialogue with the corporeality of Baga’s forms — with the three-dimensional objects that create the landscape in which we move; with the ethereal video projections; and with the representations of people, things, and spaces as well as color shapes and sourced imagery that populate those projections. Some of the imagery has a relationship to the space itself, since Baga brings the studio into the exhibition space, by continuing to create and rearrange images and things. And some of the sourced imagery relates to icons from pop culture — whether it’s Madonna (as in Madonna y El Niño, 2011, shown at Kunstverein Munich) or Plymouth Rock (as in Plymouth Rock, 2012, shown at the Whitney Museum of American Art). It’s a highly referential, highly mediated environment like the one we’re used to inhabiting, so some viewers surely think of the contrast between viewing Baga’s work and surfing the Internet or going to a shopping mall or seeing a Hollywood film. Unlike blockbusters, which tend to focus and direct our attention, Baga scatters it — to the various details of her immersive, but never authoritarian, media-rich environments. Baga’s installation at Art Statements, at Art Basel 2014, is titled “Love – Poem.” It, too, uses a 3D video projection to create a theatrical setup. 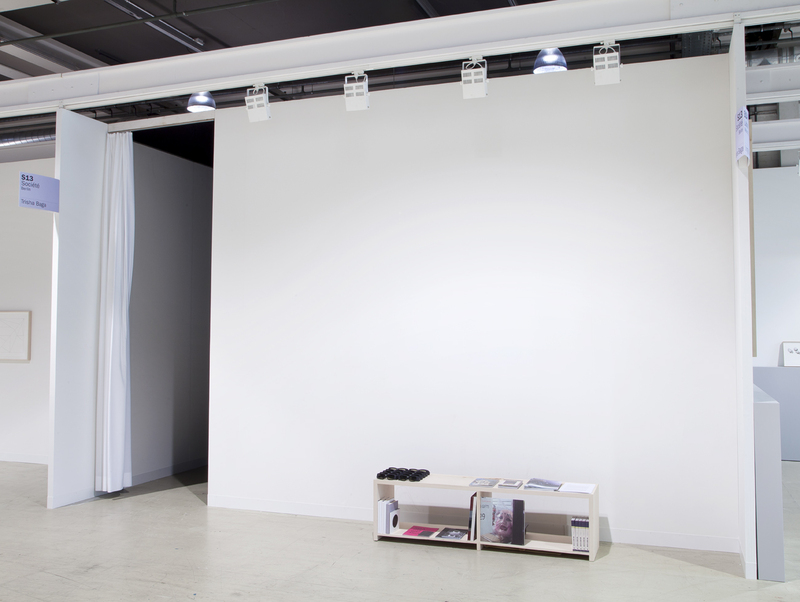 Two canvases hang on the wall where the projection falls. One depicts a tennis court; the other is covered with glow-in-the-dark paint. Over the course of the video, an image of Jan Vermeer’s “The Girl with the Pearl Earing” is projected onto the glow-in-the-dark canvas, sometimes leaving an afterimage of Vermeer’s painting. As a result, the history of illusion in painting (as in the Dutch renaissance) and the novelty technology of glow-in-the-dark are joined in a reflection on photography. 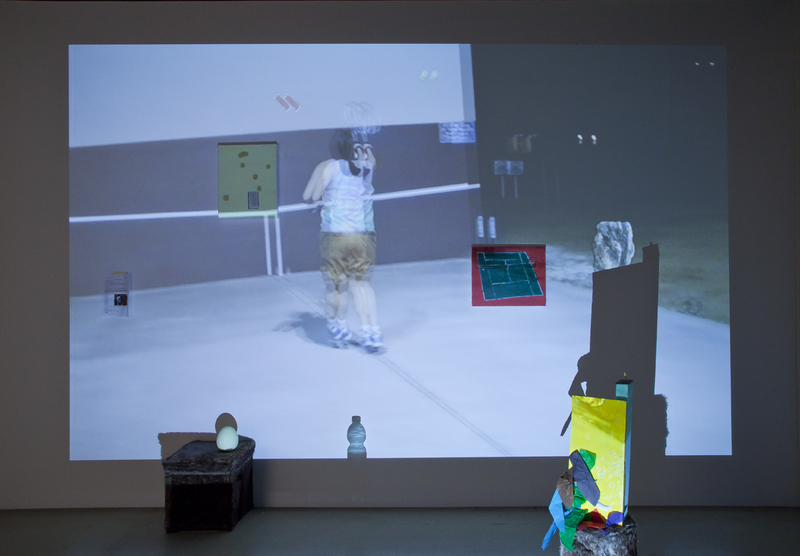 In addition, the installation is filled with a variety of more personal associations, which include the references to tennis as well as the video taken in her childhood home, and the voiceover of Baga’s mom speaking. Voiceover is also one of the ways in which Baga uses language in an abstracted form: The voiceover playing throughout the video is a series of instructions in Burmese (which Baga doesn’t understand, nor expects the majority of her audience to), the words we hear Baga spelling aren’t words, and the word that pops up on the screen is incomprehensible. Altogether, her use of language stands to represent her desire, as with all her work, not to control meaning — but to allow it to cultivate through the viewer.